Hi, I'm Maxi! 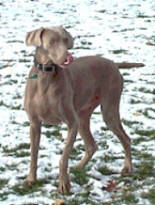 I'm a Weimaraner and if you know anything about Weimaraners, you know that I had to have my own web page. 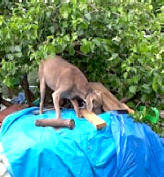 It's a good thing my human (Jim) has some useful talents. I'm trying real hard to make Jim and his family happy. You see, I'm a 3-time loser, a secondhand dog, given away by owners who no longer wanted or could care for me. I don't know why my other humans gave me away. The stories that I've overheard were all sad. The first one became ill; her sister tried to take care of me, but her job took her away from home. The third one divorced and didn't have enough room for me in her new home. went to a new home with one of Jim's co-workers while I stayed with Jim. Bob's a nice guy and has great toys: a boat and a cabin on Lake Erie. His wife even leaves Bob's lunch on the table for Blue to eat. Blue even has her own human kid! I'm not envious, though - Jim's a nice guy and he also has neat toys, hobbies and a kid, too. 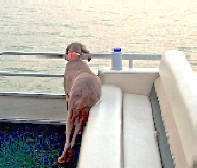 Jim takes me everywhere: boating, camping, hunting, the DQ drive-thru and long walks to the park. Even hotels, pre-school, parades and ball games! He also takes me to obedience school. Jim's father-in-law told him a big dog like me needed to go to school. School's not a bad thing. Jim and I really enjoy it and became members of the not-for-profit Follow Our Lead Training Club. I earned my Canine Good Citizen (CGC) award, my Companion Dog (CD) obedience title, Therapy Dog International (TDI) and Junior Hunter (JH) title. It took me longer than expected to earn my CD title because I have trouble sitting still. I know I should just sit there and wait for Jim to return from across the room. But I see no good reason for him to stand across the ring by himself. He gets lonely when I'm not close. You're not going to believe this, but Jim took me to these neat places where they gave me nice orange ribbons for finding and pointing birds. Talk about fun! Wow! I have to tell you, earning my Junior Hunter title was much easier than my Companion Dog title! Like Blue, I have a kid. We're the best buds and I keep a watchful eye on him. I protect and care for him as if he was my pup. It took me some time before Jim could trust me loose in the house. I really wasn't housebroken when I came to live with Jim and his family and I liked to chew on my boy's toys. I didn't like my crate at first, but now I sleep in it even when I don't need to. My boy goes to this neat place during the day; it's called school. He took me to Show and Tell where I met all his little friends. It was really great! There were rooms full of kids and I stopped in each one and met them all. Sometimes, my boy and I fight over toys, but in the end, I always give in and let him win. OK, sometimes I eat his cookies - I can't help it! Those cookies are just too good to pass up! It took awhile to get used to Jim rough-housing with my boy. I know they are just playing, but I don't want anything bad to happen. When my boy's cousins start playing rough, I act as referee - I just wade in between them and separate the group. I'm really glad things have worked out for me and Blue. Who knows what would have happened if Bob, Jim and their families hadn't been such softies? Time to go. It's snuggle time and I see someone sitting on the couch! 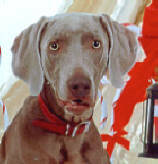 Maxi passed away in June, 2006; she had lung cancer. She was a truly great dog, a much-loved member of our family and will be greatly missed by all.